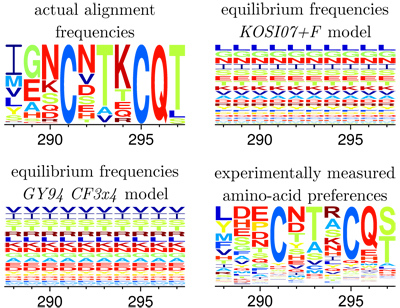 Experimentally informed models represent the site-specific amino-acid preferences observed in real sequences much better than common alternatives. Beta-lactamases are bacterial proteins that confer resistance to widely used antibiotics including penicillin and its derivatives (Therrien and Levesque, 2000). Evolution of antibiotic resistance is a major public health concern, and so a deeper understanding of how proteins that contribute to resistance evolve is of great interest. Current models of the evolution of beta-lactamases are built on insufficient information regarding the evolution of specific sites, and thus are forced to make the assumption that different sites within the proteins evolve in identical fashions. However, with the widespread adoption of high-throughput sequencing, it is possible to assess the effect of every possible amino acid variant on protein function and determine site-specific selection of protein variants. To better understand how beta-lactamases change over time, Dr. Jesse Bloom (Basic Sciences Division) used data from experimental evolutionary experiments. "The evolutionary analysis of gene sequences is one of the most widely used procedures in all of computational biology, but the models used in these analyses are extremely over-simplified," said Dr. Bloom. "Our work demonstrates that new high-throughput experiments can be used to make much more accurate gene-specific evolutionary models. I believe these more accurate models will eventually have wide applications, such as by improving the inference of evolutionary relationships and by enhancing our ability to detect positive selection." To create an improved model for the phylogeny of beta-lactamases, Dr. Bloom used data from a method known as deep mutational scanning, wherein a gene is subjected to random mutagenesis and in vitro functional selection. Following selection, the gene is deep sequenced to obtain the frequencies of mutations before and after selection. Assuming that the laboratory selection was representative of the gene’s actual biological function, such experiments can provide an approximation of the site-specific selection on particular mutations. Deep mutational scanning data of the TEM-1 beta-lactamase was used to inform the evolutionary model described in this work. The deep mutational scanning of the TEM-1 beta-lactamase provided sufficient data to analyze the effect of 96% of the 5,453 possible amino acid mutations. Fitness values for each mutant were calculated such that they were proportional to the highest concentration of antibiotic on which bacteria harboring that particular variant was able to grow. These fitness values were used by Dr. Bloom to determine the amino acid preferences of each site in TEM-1. To test the fit of his experimentally-informed evolutionary model to the phylogenies of beta-lactamases, Dr. Bloom next collected sequences of a number of other TEM beta-lactamases, which are closely related to TEM-1, as well as a number of sequences for the SHV group of beta-lactamases, which are the next most closely related group. He then assembled these sequences into phylogenetic trees, one each for TEM and SHV beta-lactamases and one combining both families. In both the individual and combined cases, the experimentally informed model was superior. High-throughput sequencing technologies have revolutionized biology and have the potential to provide insight into evolutionary processes. In the present study, the combination of mathematical modeling and experimental data from deep mutational scanning has provided a superior evolutionary model for the phylogenies of multiple beta-lactamases. This study demonstrates the power of experimental evolutionary studies for explaining the evolutionary trajectories of medically important proteins and suggests that analysis of site-specific amino acid preferences could prove to be a powerful tool in the interpretation of phylogenetic data. Bloom JD. 2014. An Experimentally Informed Evolutionary Model Improves Phylogenetic Fit to Divergent Lactamase Homologs. Mol Biol Evol Epub ahead of print. See also: Therrien C, Levesque RC. 2000. Molecular basis of antibiotic resistance and beta-lactamase inhibition by mechanism-based inactivators: perspectives and future directions. FEMS Microbiol Rev 24(3):251-262.